Scale is the most challenging part of the search as most home décor accessories and lamps are made quite large for today’s architecture, i.e., vaulted ceilings. Since coach spaces are smaller, designers strive to be mindful of what fits best. Marathon Coach designers shop both locally and online, always looking for unique and unusual items that are sophisticated, yet with a hint of whimsy. Travel themes are popular with both Alan and Brenda, so coaches are often adorned with globes, maps, binoculars, etc. Alan is fond of elephants, placing one in every coach he designs, while Brenda has an affinity for decorative boxes and geodes. Marathon’s interior design team enlists the help of a local artist to custom create all of the coach floral arrangements. The team uses these plants as one element to add ‘life’ to spaces. They’re especially fond of succulents for greenery and beauty. All artwork in photo recesses and frames are custom created by a local shop. Marathon’s mirror bottom display curios are excellent for glass and stone, therefore the team strives to find items that sparkle and shine under the warm LED lights. The interior designers seek out handsome trays, baskets and lidded boxes because they serve as practical and functional storage in a small space, as well as adding charm. Brenda often focuses on texture when selecting accessories. “So much of our interiors are smooth (floors, walls, countertops) that I purposefully add contrast with nubby pillows, geode bookends, a thick fur throw, rustic wood-grain candleholders, etc.,” said Brenda. All Marathon’s coach candles are battery operated for safety. The designers often start buying accessories one to two months before the coach is scheduled to be complete. For example, because shops are full of holiday décor in November and December, it’s more challenging to find timeless, elegant décor, so the design team begins sooner and chooses online venues. 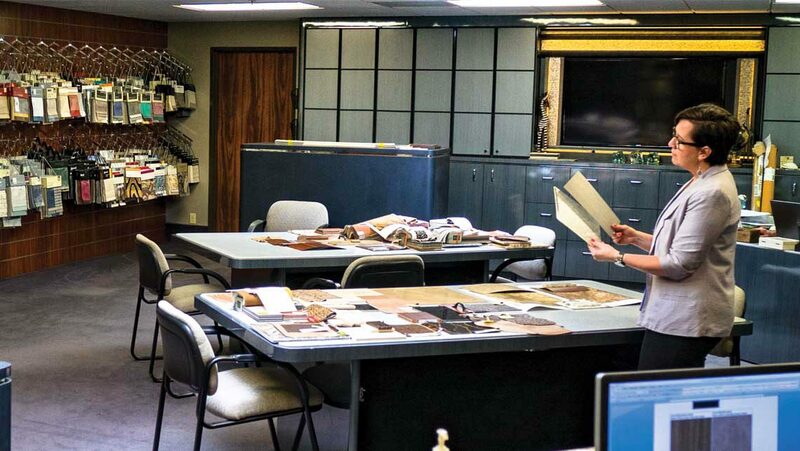 An accessories package upgrade is a common, and sometimes the only, client request when considering a remodel on a long-loved or newly purchased pre-owned coach. With custom designed pillows, galley ware, lighting, artwork and rugs, a coach can be completely transformed, often feeling like a brand new coach.